The right hair can make or break your Halloween costume. Think: Princess Leia’s iconic buns or the Bride of Frankenstein’s signature white-streaked bouffant. If you’re searching for the perfect Halloween hairstyle, check out these awesome Halloween hair ideas from Instagram for inspiration. Rosie the Riveter is a classic Americana costume, and her bright red bandana is key. Complete the vintage look with perfect pin curls. 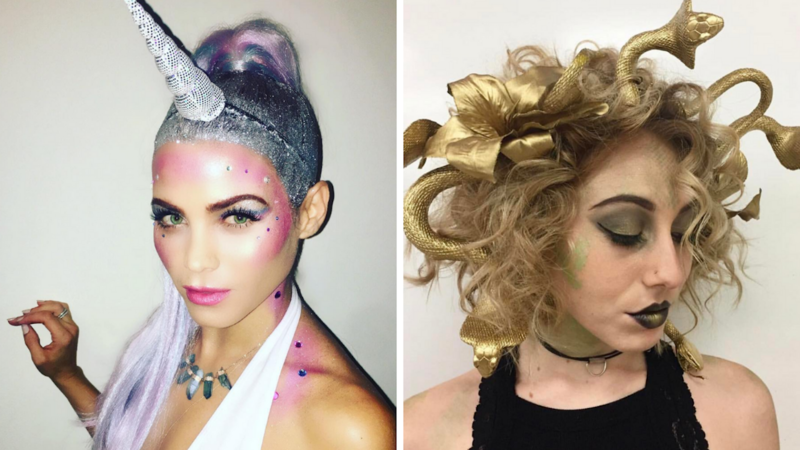 Look absolutely magical this Halloween with a unicorn horn headband and some glitter hairspray. Jenna Dewan expertly rocked the look back in 2016. This adorable pumpkin bun would work for kids and adults alike, making it perfect for a matching mommy-and-me costume ensemble. Recreate this look using a bun maker and some orange hairspray (don’t worry, it washes out!). If you have naturally big, textured or curly hair, the lioness look is totally fierce and easy to accomplish. Add some cat ears and makeup a la model Joyjah, and you’ll be good to go. If you have long hair, all you have to do is flip it to the front over your face to look exactly like Cousin Itt from “The Addams Family.” Be sure to add some sunglasses like this Instagrammer did to make it super-recognizable. Is there any character more recognized for her hair than Rapunzel? This pretty Rapunzel-style braid by The Beauty Shop Page would transition easily from Halloween to everyday life. You can get a Medusa headband for around $10 online. Go with big, voluminous curls and maybe add a touch of gold-colored glitter hairspray to amp up the look. Hairstylist Alexandra Kirkley polished off the look with dark lips and dramatic eyes.